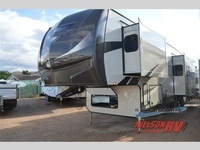 Nielson RV is located in St George and Hurricane, Utah. We have the largest selection of new and used travel trailers, fifth wheels, toy haulers, class A, B, C motorhomes. We carry the top manufactured brands such as, Forest River, Keystone, Starcraft, Winnebago, Coachmen, Highland Ridge and much more. All of our new product come with a RV Warranty Forever, nobody else can match this warranty.